An agricultural and educational reformer born in 1868, Kenyon Butterfield was the ninth president of Massachusetts Agricultural College and one of the university's most important figures. An 1891 graduate of Michigan Agricultural College and recipient of MA in Economics and Rural Sociology from the University of Michigan (1902), Butterfield entered university administration early in his career, becoming President of the Rhode Island College of Agriculture and Mechanic Arts in 1903 and, only three years later, of the Massachusetts Agricultural College. Possessed of a Progressive spirit, Butterfield revolutionized the college during his 18 years in Amherst, expanding and diversifying the curriculum, quadrupling the institutional budget, fostering a dramatic increase in the presence of women on campus and expanding the curriculum, and above all, helping to promote the Smith-Lever Act of 1914 and developing the Cooperative Extension Service into a vital asset to the Commonwealth. Nationally, he maintained a leadership role in the field of rural sociology and among Land Grant University presidents. After leaving Amherst in 1924, Butterfield served as President at Michigan Agricultural College for four years and was active in missionary endeavors in Asia before retiring. He died at his home in Amherst on Nov. 25, 1936. The Butterfield Papers contain biographical materials, administrative and official papers of both of his presidencies, typescripts of his talks, and copies of his published writings. Includes correspondence and memoranda (with students, officials, legislators, officers of organizations, and private individuals), reports, outlines, minutes, surveys, and internal memoranda. Born 11 June at Lapeer, MI, to Ira H. and Olive F. (Davison) Butterfield. B.S., Michigan Agricultural College; head of class. Married Harriet E. Millard of Lapeer, MI. Superintendent, Michigan Farmers' Institute, and field agent, Michigan Agricultural College. A.M., University of Michigan; Instructor in Rural Sociology. President, Rhode Island College of Agriculture and Mechanic Arts. Appointed to Country Life Commission by President Theodore Roosevelt; Chapters in Rural Progress published. Carew Lecturer, Hartford Theological Seminary. Honorary LL.D., Amherst College; The Country Church and the Rural Problem published. Chairman, Massachusetts Food Supply Commission. Member, U.S. Army Educational Commission; Educational Director, American Expeditionary Forces (A.E.F.). Organized World Agricultural Council and American Country Life Association; The Farmer and the New Day published. Honorary LL.D., Rhode Island State College. Member, Burton Commission on Christian Education in China. Report on Rural Conditions and Sociological Problems in South Africa published for Carnegie Foundation. The Christian Mission in Rural India published for International Missionary Council. The Christian Mission of the Church in Rural Asia published for International Missionary Council. The Christian Enterprise Among Rural People published. Moved to Amherst from New Jersey; died 26 November, leaving widow and two sons. 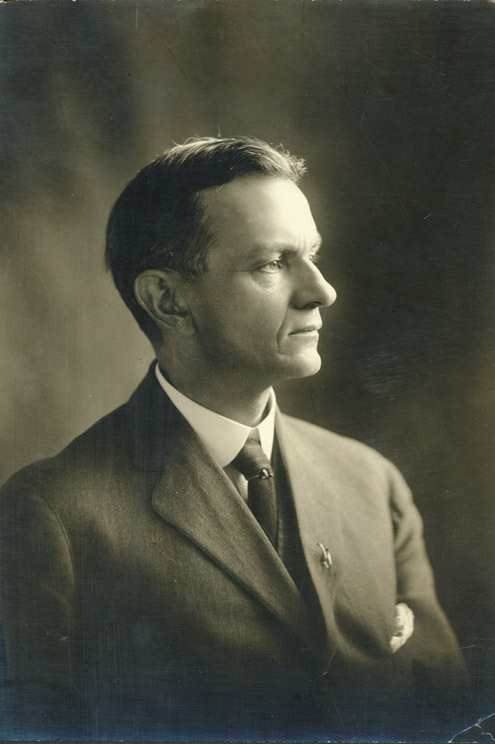 The Kenyon L. Butterfield Papers, 1889 (1906-1924) 1945, include biographical materials, administrative and official papers of his presidencies at the Massachusetts Agricultural College (1906-1924), now the University of Massachusetts Amherst, and at the Michigan Agricultural College (1924-1928), now Michigan State University, typescripts of his talks and copies of his published writings. By far the largest part of the papers was generated during Butterfield's presidency at the University of Massachusetts, but both the earliest item, a copy of his 1889 yearbook at the Michigan Agricultural College, and the latest, a 1945 appreciation by Professor Winthrop S. Welles, are among the biographical materials. The papers consist of correspondence and memoranda exchanged with faculty and staff, with state and federal officials and legislators, with officers of a variety of agricultural, educational and religious organizations, with students and alumni, and, now and then, with private individuals. There are, too, reports and outlines from faculty members and others; minutes of college administrative committees and of local, state, regional, and national councils and committees on which Butterfield served; surveys and working papers on problems and conditions at the campus, in Massachusetts agriculture, and in the rural sector of the nation; as well as internal memoranda of the President's office and newspaper clippings and magazine extracts regarding the development of the College and the evolution of agriculture and education in the nation. It is not clear how many of the administrative papers generated at the College during the Butterfield era may have been lost, but those that survive have the appearance of being representative of the administrative concerns of the time. There are no materials in the collection that deal with Butterfield's activities as a teacher and nor are there family papers in this collection. Biographical Materials is made up primarily of materials from the pre-1972 files of the Archives. General biographical materials extend from Butterfield's college yearbook of 1889, until after his death in 1935. There are several posthumous appreciations. Several folders of newspaper clippings bearing on his activities and those of the College during his Massachusetts and Michigan presidencies (though none from Rhode Island) and other matters in which he was interested are arranged chronologically. Copies of press releases relating to affairs at the College, are in Series 2, Massachusetts Agricultural College Administrative Papers. A 54" X 46" oil portrait of Butterfield hangs in the second floor of Memorial Hall. Photographs are in Archives RG 110/1. The surviving papers bearing on the development and administration of the College during Butterfield's nineteen years as its president make up this file. Its materials come from the standing files of the Archives and from two lots of Secretary's papers. These files have been arranged in subject groups under headings which are representative of those which survived in the original lots. Groupings and subject headings are sometimes generic, such as "Administrative Planning" and "Personnel and Organization"; others represent the names of specific projects, such as "Survey of the College, 1910", or defined eras, such as "World War I on Campus", and others refer to specific agencies, such as the State "Food Supply Commission", or the "Mass. (State) Commission on Investigation of Agricultural Education". Several otherwise unclassifiable folders are gathered under "General". The heading "Administrative Planning" covers material on the general organization of the College such as its "business" or purchasing and accounting practices, its overall financial support, and data on the "cost of instruction". Related materials may be found under "Mass. (State) Commission on Investigation of Agricultural Education . . . " and "Mass. (State) Legislation." Butterfield's College budgetary materials have been removed to Archives RG 4/2 Budgets. Admissions and Attendance comprise mainly materials regarding the quarrel between the College and the State Dept. of Education over the use of secondary school agricultural course credits to fulfill entrance requirements. Related materials are under "Student Matters--Regan Case." The "Agricultural Survey" was a title given by Butterfield to a series of censuses and surveys at both the individual and community levels of economic, physical and cultural resources of rural Massachusetts. It seems not to have been thought of as a single project--and it never was funded as such--but as a framework within which to coordinate a variety of smaller, more manageable studies, such as of soil surveys and/or censuses of religious facilities, to be done by College, governmental, religious and private agencies. Some related material is under "Mass. Agricultural Development Committee". Under "Alumni" are materials relating to the post World War I revival and activities of the Associate Alumni, fund raising in support of the activities of the Social Services Commission, (a student group), and statistical survey and other data on alumni. The file of "Associations" includes correspondence and materials relating to state and national institutional and professional organizations interested in rural betterment, and associations of educational institutions in most of which Butterfield was active. Among these are the New England Federation for Rural Progress, the New England Research Council on Marketing and Food Supply (see also MS 28) and religious organizations. For material on attendance, see under "Admissions and Attendance" above. "Buildings and Grounds" covers materials generated in connection with planning and managing the College's grounds, such as Manning's reports of 1911 and 1914, with analyses for the need for new buildings such as a library and dormitories, and with the dedication ceremonies for such buildings as Memorial Hall and the Mt. Toby watchtower built during Butterfield's presidency. Some related materials are under "Student Life" and "World War I on Campus" and in Archives RG 6/15; Campus Planning. A plan for a proposed barracks-dormitory and additional material related to the Manning plans of 1911 are in Archives RG 6/15. The Committee on Food Production was organized by the Governor in response to Butterfield's comments, in March 1917, first as part of the State's Committee on Public Safety and later as part of the War Food Board. Butterfield served as chairman until the committee was subsumed under Hoover's War Food Administration early in 1918. (See also "Food Supply Committee" below.) For other material on Butterfield's activities during this period, see "World War I on Campus", "General--Butterfield-Watts correspondence", and President Lewis' papers. "Conferences" comprises materials bearing on the College's programs of short courses, summer schools and conferences, and on meetings of outside organizations on campus. With the development of the Extension Service, most of the institutional programs of this nature eventually became its responsibility. "Departments" includes materials bearing on their administration and instructional programs, present and prospective, and on Butterfield's grouping of them into five divisions. Included are materials on the areas of rural social science, physical education and intercollegiate athletics, and military science, and on a proposed program in vocational guidance. Related papers are with "World War I on Campus". Under "Experiment Station" are some of its administrative papers, and materials bearing on the ten year career on this campus of the U.S. Northeastern Forestry Experiment Station, now at Upper Darby, PA. The materials in the "Extension Service" section of the files reflect Butterfield's active interest in the development of its organization and programs, its network of extension agents, its conferences and short courses, the boys' and girls' (now 4-H) club work, some early work in community planning, and other material. Included too are the replies to Butterfield's 1906 national survey of extension services. "Faculty Committees" includes administrative papers relating to committees of faculty and other College personnel, such as the Course of Study Committee. It contains the surviving papers of the Committee on the Agricultural Program, which was made up of administrative staff members and which had as its purpose the proposal of programs and legislation bearing on Massachusetts agriculture and rural life. A similar group, the Food Supply Committee, is set out separately. Minutes, working papers and memoranda of faculty committees such as that for the Course of Study have been placed in Archives RG 40. Under "Farmers' Organizations" is correspondence and materials on such statewide and regional organizations of farmers as the Farm Bureau, the Grange and the New England Milk Producers' Association. For the most part, Butterfield was not personally active in the affairs of these organizations, but he had extensive dealings with many of them. For materials on Fees, see "Tuition and Fees". The Food Supply Committee was a post-World War I campus group the purposes of which were to manage studies of the state's food supply situation, to develop the notion of the Massachusetts Agricultural College as the state's "Food Supply College", and to find ways to promote the College's programs with the public and the Legislature. It produced at least the typescript of a report. Related materials are under "Public Relations". (See also "Committee on Food Production") Material filed under "General" covers a variety of subjects, including the foreshortened College semi-centennial celebration of 1917 and the gala of 1921, materials on the College seal, a compilation of materials on the purpose of the College, etc. The "Graduate School" file includes material bearing on the development and administration of several postgraduate programs. A folder on Butterfield's "Inauguration" as College President is followed by materials on the Massachusetts Agricultural Development Committee, a body representing public and private agricultural interests. Formed at Butterfield's behest, it was designed to plan the State's rural development and to lobby for that plan; it seems to have expired with the onset of World War I. Related material may be found under "Extension", "Faculty Committees --Agricultural Program", and "Food Supply Committee". Under the heading "Mass. (State)" are a variety of correspondence, memoranda, background papers, and other materials dealing with relations between the College and the administrative and legislative agencies of Massachusetts. Among the most interesting groups of materials are those relating to the Commission on Investigation of Agricultural Education, also known as the Seelye Commission, which investigated the operations of the College in 1916 and 1917; the Department of Education and the Division of Administration and Finance, both of which contain much material on the difficulties created by the 1919 reorganization of the State government whereby the College was placed under the control of the Department of Education; Legislation, a chronological group of materials bearing on a variety of proposed laws affecting the College; and the Legislature's visit to the campus of May, 1923, an enterprise orchestrated by Butterfield and one of his last attempts to promote legislative support of the institution. Further materials on the public support campaign are under "Public Relations" and "Food Supply Committee". "Personnel and Organization" contains materials related to the College's rules of employment, faculty members and staff, their salaries and assignments, and similar topics. Further materials may be found under "Administrative Planning". Under "Public Relations" are copies of early press releases of the College and material connected with the Public Support Campaign of 1920-1923, one element of which was the visit of the Legislature to the campus in 1923. Press clippings are in Series 1. Following Butterfield's letter of "Resignation" is material on "Scholarships and Trust Funds" including those of the College and those which had an impact here. Materials under "Student Activities" bear on organized extra-curricular activities. Related material is found under "Alumni". "Student Life" bears on the room, board and costs of students, including the surveys of 1914 and 1920, fraternity matters, and the scarlet fever epidemic of 1913. Related material is under "Departments: Physical Education". Material on "Student Matters" deals with academic matters and includes material on student exchange programs, scholarship, and farm practice. "Survey of the College" (1910) is a collation of responses to questions and questionnaires which Butterfield sent out in 1909 and 1910 to students, faculty and staff members, and administrators of other colleges on a variety of subjects. Butterfield ran a number of polls from 1908 until World War I which have survived in these files. Most are filed with the topics addressed by the specific surveys. This one is set apart because it was gathered and summarized as a single project. The individual surveys are arranged in the order in which they are listed and summarized in the "Index of Digests and Reports", folder 264. Under "U.S. Govt" are the record copies of reports submitted to the U.S. Bureau of Education, correspondence and materials on the development of the Smith-Lever bill to supply federal funds to state extension services, and on the Page and Smith-Hughes bills, both relating to vocational education in agriculture. Related materials are under "Extension Service" and "Mass. State Legislation". Record copies of reports submitted to federal agencies by the Treasurer have been transferred to Archives RG 4. "Women's Program", originally called "Women's Work", includes correspondence, memoranda and other papers on the establishment of academic programs and living quarters for women students, which eventually led to developing the School of Home Economics and to building the first true dormitory for women on campus, the Abigail Adams House. Under World War I are a variety of materials dealing with Massachusetts Agricultural College students and alumni military service during that war, the draft status of College personnel and students, contributions of the College to the war effort, its postwar reconversion and the war history of the College, and the dedication of Memorial Hall during the semi-centennial celebration of 1921. Other materials on this period are found under "Committee on Food Production", "Buildings--Memorial Hall", "Departments--Military Science", and in President Lewis' Papers. Plans accompanying Manning's report on the campus grounds have been removed to Archives RG's 6/15 Planning, 36/100 and 40/11 Waugh. When Kenyon Butterfield left the Massachusetts Agricultural College in 1924, it was to become President of his alma mater, the Michigan Agricultural College. Four years later, in 1928, he retired at the age of sixty. The Michigan series is made up of memoranda, correspondence and papers from that presidency. It includes seven folders reviewing the "course of study" or academic programs and a folder each of material on the overall administration of the Michigan college; on teachers' retirement plans he was trying to develop there; on "boys' and girls'" work; and a few miscellaneous matters. This series contains correspondence and papers relating to Butterfield's dealings with religious and other organizations outside the College and beyond Butterfield's responsibilities as its President. It includes the Massachusetts Federation of Churches, the Y.M.C.A., and the Hillside School, then in the town of Enfield. The series is arranged alphabetically by name of the organization. Correspondence with and papers relating to agricultural and educational associations and to farmers' organizations with which Butterfield dealt primarily as President of the College are in Series 2, Massachusetts Agricultural College Administrative Papers. The series is made up of three subseries, one of Butterfield's addresses arranged chronologically, a second of his articles arranged alphabetically by title, and a third of books he authored. Subseries 4/1, Addresses, begins with a list prepared after Butterfield's death of his "Writings and Addresses in Goodell Library". The typescripts of the addresses themselves are from the period of Butterfield's presidency of the Massachusetts Agricultural College, the latest item being his address at the June 1924 Commencement of the Michigan Agricultural College. Included are Assembly and Chapel talks, Baccalaureate and Commencement addresses, and dedications. Several talks Butterfield gave off campus are also here, including his Commencement address of 1916 at Purdue, a 1922 address at Amherst College, and the Russell Lecture of 1923 at Tufts College. Some undated addresses are in folder 10, and in the Massachusetts Agricultural College administrative papers of Series 2 are several outlines which may have provided the basis for other addresses. Subseries, 4/2, Articles and Pamphlets, includes printed copies of over thirty of Butterfield's pamphlets and articles, issued between 1898 and his death in 1935. His writing appeared in a number of agricultural, scientific and religious journals, and in agricultural and educational magazines. Subseries 4/3, Books, includes printed copies of four of the seven books the Dictionary of American Biography credits to Butterfield. They are: Chapters of Rural Progress (1907); The Country Church and the Rural Problem (1911); The Farmer and the New Day (1919); and The Rural Mission of the Church in Eastern Asia (1931), Butterfield's last report on the church and agriculture in Asia to the International Missionary Council. According to Ray Stannard Baker's appreciation in the pamphlet published by the Associate Alumni in 1937, Kenyon Leech Butterfield, 1868-1935 , Butterfield worked the last several years of his life on a book dealing with rural life and problems throughout the world. Baker reported that the incomplete manuscript was in the Jones Library in 1937, but it has not been located. Administrative Planning: Cost of Instruction "per capita"
Associations: National Committee on Rural Federation, etc. Extension Service: Conferences, Short Courses, etc. Food Supply Committee: "Food Supply Problem"
General: Purpose of the College-"Year by year"
Mass. (State) Div. of Administration "College at the Crossroads"
Mass. (State) Div. of Administration "Minnesota Report"
Mass. (State) Legislation: "Effect of State Control on Extension Work"
World War I: Draft Status of Faculty, Employees, etc. World War I: Military Science - R.O.T.C. In the process of arranging these files, the many folders which contained materials from two (or more) presidencies have been divided, and the papers have been distributed to the files of the appropriate president. Papers related to the formulation of the annual budgets forwarded to State authorities for enactment by the Legislature, and to the apportionment of the resulting funds, have been relocated into the overall chronological budget file in Archives RG 4/2. Materials generated by the Course of Study Committee and several other committees made up largely of faculty members have been shifted to Archives RG 40/A2. Board of Trustees minutes and papers have been placed in Archives RG 2. Many copies of papers duplicated in this record group or elsewhere in the collections of the Archives have been discarded. Processed by W.B. Cook, Jr., 1982. Cite as: Kenyon L. Butterfield Papers (RG 003/1). Special Collections and University Archives, W.E.B. Du Bois Library, University of Massachusetts Amherst. Butterfield, Kenyon L. (Kenyon Leech), 1868-1935--Archives. Massachusetts Agricultural College--Alumni and alumnae--History--Sources. World War, 1914-1918--Education and the war--Sources.